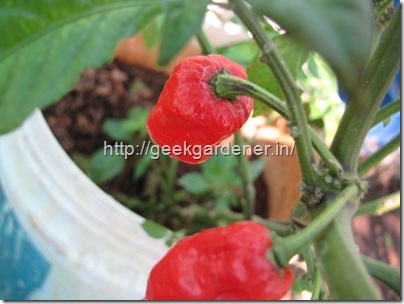 The post on Bhut Jolokia, the ghost pepper, I made some time back got lot of attention and so many of the readers wanted bhut jolokia seeds too. 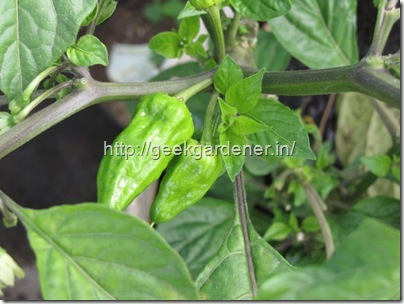 No post on growing a vegetable is complete without talking about its harvest and Bhut Jolokia is no exception. One aspect that is very different from other chilli plants is that the number of flowers. 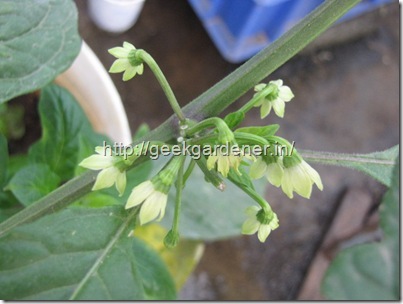 Bhut Jolokia flowers profusely with multiple flowers in a node. Not all of them set fruit. At least in my greenhouse ( with limited pollination), I was happy that 1 or two set fruit. The plants are very sturdy and grow vigorously. The fruit, as you see is little wrinkled and kind of gives a “bad boy” look. Believe me, the taste is no different from its looks. Very very fiery. I even thought I will post a picture of myself tasting it! I consumed few when they are green but for seed saving, I let all of them ripe on the plant. Look at the pic below. The whole plant was looking like as if there were 100s of Chinese lanterns hung on it. What you see below is Batch #2 harvest. The previous batch was almost this much but the fruits were little bigger in size. All this will become seeds in a few days. There is still more fruits waiting to be plucked. Every visitor who come to visit my garden gets so much excited when I tell them “This is the hottest pepper in the world, The Bhut Jolokia”. Few of them took a fruit or two to their home to taste it. As always, I warn them before giving the pod. This is no Child’s play. Next post: Caro rich, An orange beefsteak tomato that broke all previous records in my greenhouse in terms of weight. Stay tuned! Congratulations on a nice crop you harvest. I know this not a big thing for you. As you are usual to get good fruits from your plant. For me , this is still a dream. But working on it, hope, soon live the dream. Every plant, every season is a big thing for me. I just patiently wait for these plants to grow and yield. Good luck on living your dream. I am one of those visitors who go the pod:) but haven’t had the guts to try it out yet. How was it in food? Last time you have given me the seeds of Bhut Jolokia and even after two attempt, the germination it self is unsuccessful. Hope you remember I sent you a mail in connection with this matter. I have some seeds with me. But I didn’t tried to sow. But at the carrot that you given is very successful. Can I get some more well dried seeds of Bhut Jolokia. Awaiting for reply. Hi, I’m from bangalore. I planted Red Radish & Carrots in a Thermocol box 9 actually flicked my husband travel ice boX, punched holes in the bottom and prepared the soil with sand, soil, manure and compost) I planted the Beans and Onions in the ground all on Feb 12th. The radish are swelling up well ( I pulled one out yesterday and realised it needs another couple of weeks to grow to full size) and the carrot plants are quite steadily growing. Not a single germination of onion and beans. Now for the Questions; What could have gone wrong with the onions & beans? How do I recognise that the radishes are ready for harvest. the one I pulled out yesterday was quite spicy. “This is the hottest pepper in the world, The Bhut Jolokia” – umm, that’s not true any more. Its the 3rd hottest. Guinness rates the Naga Viper as the hottest. Maybe you should grow some of those next time. At high SHU levels, I guess it doesn’t matter which is hotter. Or atleast very difficult for us to tell them apart.. ;).. I know exactly how you must have felt! I too got a few Bhut jolokia chillies some years ago from an Assamese friend. Even when I split the chilli to get the seeds, my fingers started burning! But the fruit do look so attractive on the plant with its bright red olour. 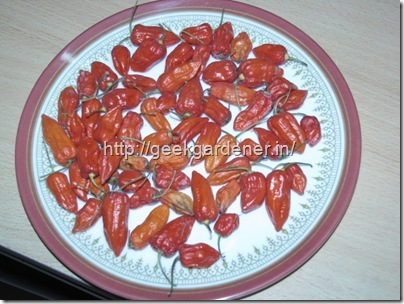 Could i get some bhoot jolokia seeds too….. I planted some jalapeno seeds and have two plants. One has grown tall like a vine along the balcony grill and the other is a short shrub. Both are placed in balconies in different rooms but get equal sunlight etc. Both have flowered and fruited. In both plants the first couple of chillies were really fiery like the chillies I saved the seeds from. However the size and shape of the chillies in the first plant was the same as the chillies from which (long and broad)I had planted seeds. The other one was has always had curled small chillies. Subsequently both plants now have only curled chillies. Additionally, neither one is even spicy. They are just juicy and fleshy but have no fiery heat. What must have happened? Both plants are well cared for. I use Amrutmitti for fertilizer applied fortnightly and water regularly. The leaves are dark green but appear slightly curled as if they havent been watered. The funniest thing is there are so many ants on the plants. Sometimes they are red ants, sometimes small black ants. I dont know if this is good or bad for the plants and if the ants are the consequence of the chillies losing the spicy quality. Any thoughts on how to improve this situation will be very welcome. Too much of crowding of ants could possibly be because of mealybugs or aphids as the ants herd them together and feed on their secretion. Mealybugs would be kind of whitish bugs which might have white hairy growth on them and old ones would protect themselves with white spongy growth. Aphids can be yellowish/greenish/brownish tiny organisms that usually affect the peppers. Try googling for their pictures to make sure you know what you are looking for. If the leaves are curled upwards, it could be caused by thrips. For Thrips, Ants, mealybugs, and Aphids, try this generic spray which can be made at home. Hope that helps. you might want to take pictures of the leaves and undersides of leaves that look sickly which might help us identify what we’re dealing with. Thank you for your prompt response. You are right. There are some whitish stuff on the plants. I usually wipe them clean with a cloth :-)I shall take some pictures tomorrow and post them. This is one the best blog i have ever came across….when ever i get time i visit this blog i really love the way you write and grow your crops on terrace…..after going through this blog i have started cultivating tomatoes,capsicum,strawberries and some other green leafy veggies on terrace earlier i use to grow only flowering plants but now am growing veggies too along with flowering plants…. hats off to you for starting this blog and sharing your valuable ideas with us…. i think people should stop complaining about the space and start their own rooftop farm..
We stay in first floor ( bangalore , near CVraman Nagar) ( so cannot do rooftop gardening – as the owners stay in the second floor ) . we get enough sunlight in the balcony , so i have planted Tomatoes and chillies , what else can we plant in containers . I would like some Bhut Jolokia; wondering if its available in Bangalore. Any help on this would be highly appreciated. could you please guide me about kitchen gardening calender in uttar pradesh ? Great to see someone from Bangalore growing and most importantly sharing info on Bhut..
would like to know your experience on these factors GG, also do you have any seeds left for sale. can peas be grown in a pot? I’m from chennai. And as you know the weather over here is scorching right now but still inspite of the scorching weather I have managed to grow the Naga morich plants from seeds that I got of ebay.Now like all other Naga chilly my plants are flowering vigorously but it all drops down and I haven’t got a single fruit formed out of any flower so far. This is really disappointing as I put a lot of effort growing this plant in “Chennai” I even fertilise the flower by rubbing a damp paint brush. But still no fruits. Im watering it regularly and also fertilise the soil every week with panchakavya. What else should I do please help.